Merbau, also known as kwila, is a beautiful and durable timber that grows in the Southeast Pacific Rim. This area includes Indonesia, Papua New Guinea, Fiji, Malaysia, and the Philippines. It’s a type of hardwood that is extremely popular for manufacturing and construction, especially when it comes to outdoor items exposed to harsh conditions. 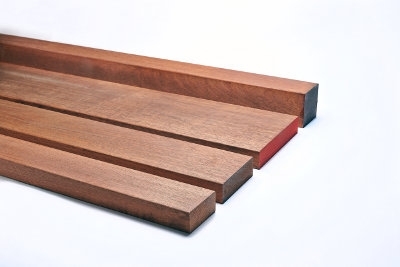 Sunstate Timbers carries merbau planks in various pre-cut sizes to suit several building and home renovation projects. Whether you want merbau decking timber or merbau timber posts, we guarantee that all our merbau timber is responsibly harvested. No matter how large your floor or outdoor entertainment area is, we can accommodate any size and quantity at very competitive prices. Merbau is highly durable due to its natural oils, allowing it to endure harsh temperatures and climates as well as salty air and other extreme conditions. This makes is a popular choice for decking and outdoor furniture. The oiliness of this timber also prevents it from cracking, splitting and shrinking. For this reason, it’s desirable for a range of applications around the home, including cabinets, counters, bench tops and flooring as well as commercial applications like to build marine jetties. Not only is it durable but incredibly attractive, with a truly unique colour and tone. The timber starts out as a yellowish-brown after it’s been cut, only to age into a deep brown hue, almost red. It’s also common for merbau to feature a golden streak in its grain. This gives it a luxurious finish that adds elegance to indoor and outdoor spaces. Merbau timber is an excellent wooden material that is easily installed and requires minimal maintenance. At Sunstate Timbers, our team have over 50 years of experience in the lumber industry, including supplying merbau timber for a variety of domestic and commercial applications. Visit our timber yard today to collect high quality merbau timber for your next project. We also provide a number of other products such as fencing supplies, landscape timbers and services such as milling, grading and delivery. For high quality timber products in Brisbane, call our team on (07) 3204 2533 today or contact us online.